More than any other ancestral hometown, Rybky, Slovakia has always had the strongest pull on my heart. Maybe that’s because it was the first ancestral hometown that I learned about when I was young, or maybe because it seemed to be a place that others were committed to remembering — or perhaps both. 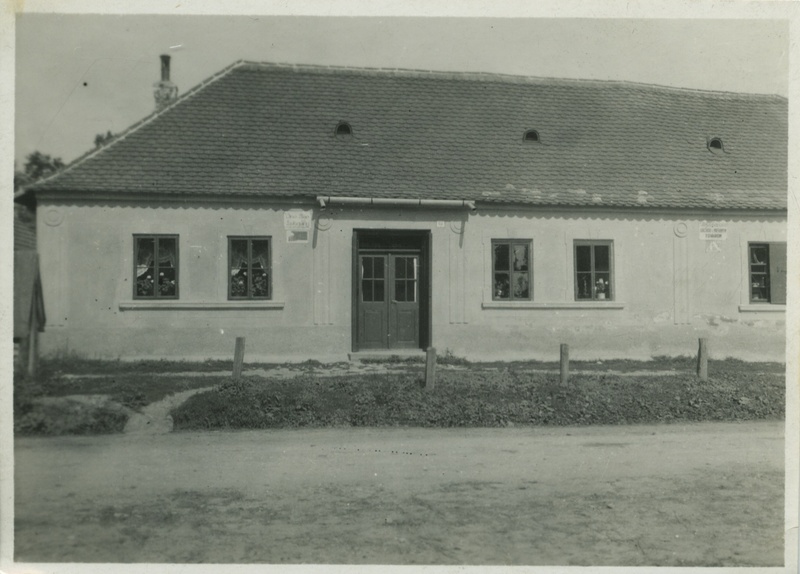 My grandfather brought a snapshot of his mother’s childhood house in Rybky with him when he came to America in 1939 and when I inherited my grandparents’ photographs, I inherited that one, too. It isn’t a great photograph and there are no people in it, but it must have been important in some way if he brought it with him. But it wasn’t just my grandfather Frank, who never lived in Rybky, who had memories of it. His cousin Frances once wrote to me that she had vivid memories of visiting Rybky with their mutual grandfather, and another cousin, Egon, has a similar photograph of Rybky from when he was taken on a visit as a young child. More than any other familial hometown, this one seems to have a stronger gravitational pull than others. I have never seen any other decades-old photographs of any other ancestral birthplaces or houses and I feel like that means something. 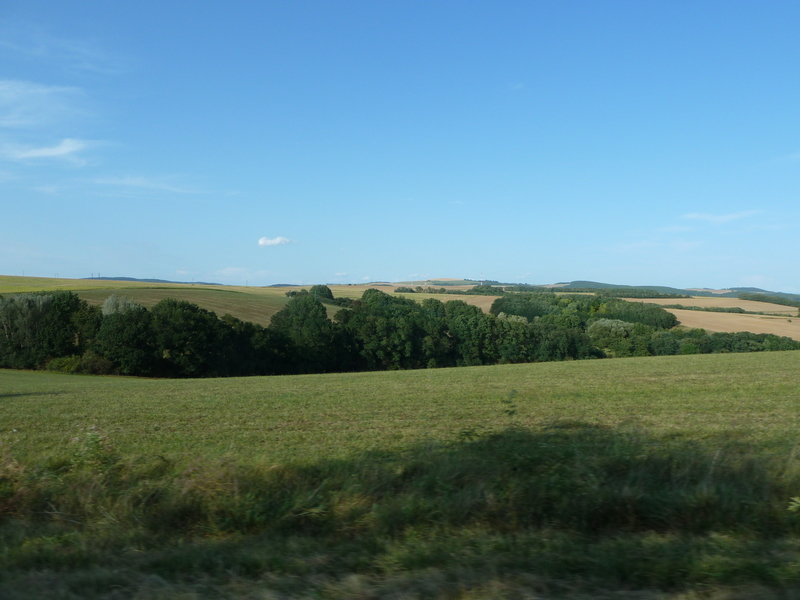 Driving to Rybky from Vienna — the Bass family migration in reverse — takes you though farmland, wind plants and small towns whose occupants seem to have fled for work in other, bigger places. When you cross the border, the contrast between the Austrian countryside and the Slovakian is striking — the communist past is tangible in the post-1940s architecture, the lack of readable road signage, the level of prosperity. The natural beauty is striking too — rolling hills, fertile soil, roads lined with fruit trees. When you make a left after passing through the city of Senica, the road to Rybky, too, is bordered by apple and plum trees and climbs uphill a little bit before reaching the town. Signs bearing the town crest mark your arrival and I realized, as soon as we started driving down the road, that it was nothing like I had imagined. Rybky, in my head, was nothing more than a pinpoint on the map, a teeny hamlet of dilapidated (yet of course picturesque) houses, old ladies in babushkas and old men smoking pipes on their porches, a sleepy place where only old people and memories remained. But in reality, it is nothing like that. It is a real town, with well-kept up homes hugging the main road, modern cars and people in modern clothes, large backyard garden plots, and a new soccer pitch. I thought it would be easy to determine which of the houses was the Bass home, but I wasn’t expecting to see so many homes, nor that they would all be such a similar style. What I expected was a place that time had forgotten, an imaginary place that my dead Basses might inhabit — but Rybky is a real place, a place so in our own time that the GPS chip in my camera recognizes it. Though I tried to tell myself we were only making the trip to Rybky so that I would know what it was like, I hoped that I would be able to find something of my dead Basses in it. There was the house, after all, and there were the remaining graves of a Jewish cemetery. I knew that my ancestors had been buried in that cemetery once, but I tried not to believe that I would actually find them. 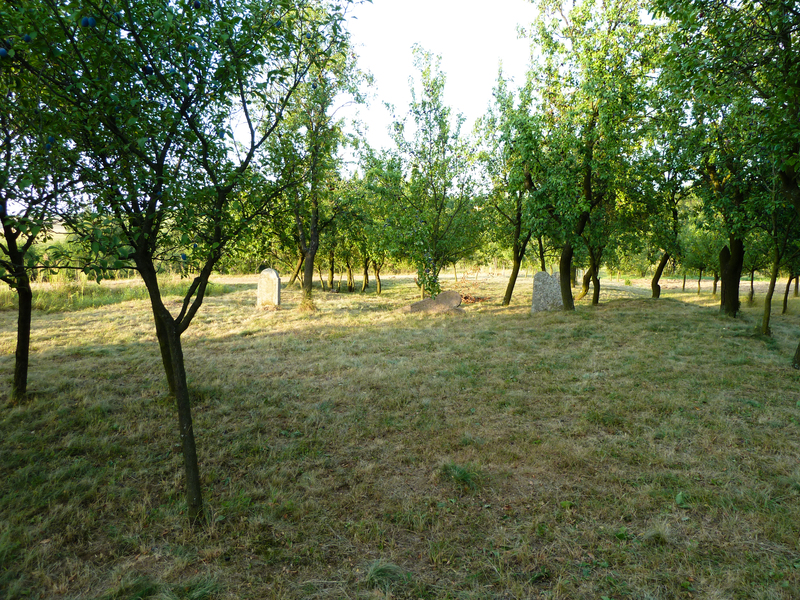 Passing out of the town and climbing slowly uphill, we scanned the surrounding fields and orchards for any sign of a Jewish cemetery, which the internet had told me was only three remaining stones in someone’s field. We didn’t expect to actually find it because we didn’t know where it was supposed to be — there are no directions and no coordinates for it on the internet (the only place apart from my family photos and stories that I had ever learned anything about Rybky). 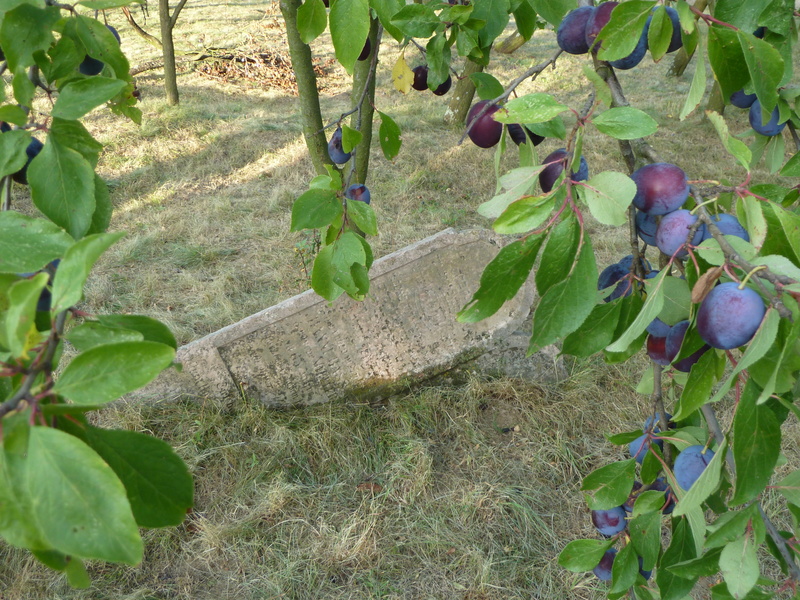 Suddenly though, on the right side of the road, we caught a glimpse of three crooked gravestones standing quite clearly in plum orchard and a man bending over near them picking fallen fruit. In shock, we drove for a while, passing through some more small towns along the hilly road that was still sporadically lined with trees. I kept hoping that when we turned around and headed back, the man would be gone and I wouldn’t have to use the cobbled together Slovak phrases I assembling from the vocabulary words in the back of our guidebook. When we parked down the road and walked back uphill to the orchard, the man was there, still picking plums, and looked up at us as we approached. I smiled, raised my hand and said, “dobry den,” then “prosim,” pointing at myself then over at the three gravestones. 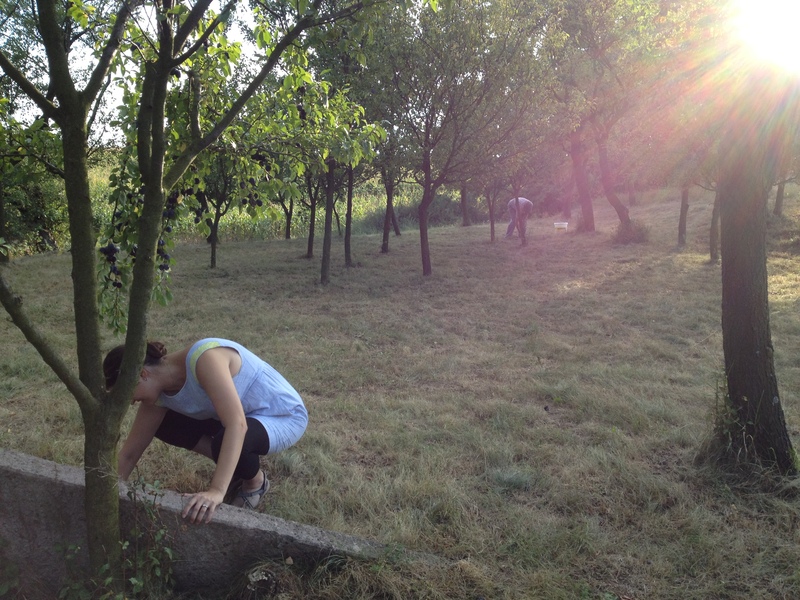 He sort of shrugged, seeming to say, “okay whatever, sure, I don’t care,” so I said thank you in Slovak and we walked up the small embankment into the orchard and over to the stones. At first, I couldn’t see anything legible on any of them — two seemed to be almost bare on the side facing the road, the middle one covered in lichen and moss. The double stone on the right was leaning backwards, as if a few more winters would likely topple it over for good, and when I walked around behind it, I saw that it was perfectly legible — E. Mandler, d. 1913 (at 92!) and F. Mandler geb. Preiss. The stone the furthest to the left was still standing relatively straight, some Hebrew on the back relatively clear, but the German (I assume it was German once) on the front turned into nothing more than shallow divots. Then I went back to the pink stone in the middle, which was only half above ground, the right side of it sunken completely into the dirt and grass. I scraped some lichen away with my hand and after a few moments of disbelief, I realized it said “Hanni Bass,” that I had my hands on the grave of my great-great-great-grandmother. I scraped away more lichen with my fingers, dug a little bit into the grass at the base of the stone and her maiden name, Mittler, and the 1885 of her death emerged very clearly. We cleaned and cleaned with our fingers, then finally with a sock and a bottle of water retrieved from the car. 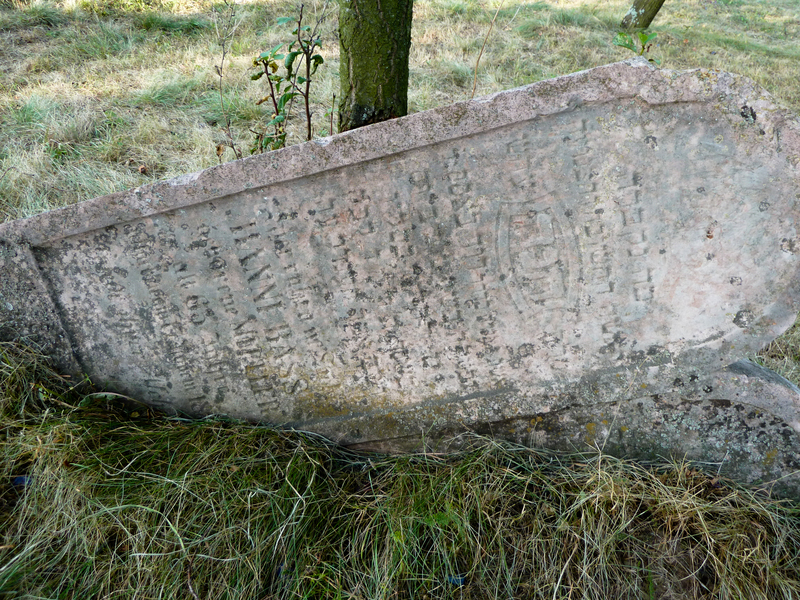 The name of David Bass (the great-great-great-grandfather who had died just weeks after Hanni) was lost underground, but the pink marble on Hanni’s half of the stone was still very pink as we cleaned, the willow tree at the top of the inscription still clear and oddly appropriate since a tree laden with plums was in fact literally growing out of their bones. The man in the orchard had largely ignored us when we first began poking around, but as our excitement became more obvious and our cleaning a gravestone with a bottle of water and a white cotton sock made us seem more and more crazy, he started coming closer, probably trying to figure out what we were doing. Paul asked him, finally, to take a picture of us, which he did after some confusion with the camera, and with that as an ice-breaker, he started talking to us in Slovak, I think about plums. His name was Josef and he picked a few plums off the trees for us and cracked them in his hand, splitting them open around the pit, offering us a taste. We told him we were from California and Paul tried to explain that I was the fruit borne of Hanni and David, just like the plums we were eating. After a little more talking he indicated that we could take as many plums as we wanted but that he was going home. He headed down the road with his big white bucket of plums on a little cart and we stayed for a little while longer, taking more photos and scraping off more lichen, while I tried to sear each and every memory of the place into my brain. Nothing about Rybky was anything like what I had pictured. It wasn’t an imaginary storybook shtetl, but a place inhabited by real people, both dead and alive — a place where my ancestors lived and worked and where Josef is hopefully telling people about the weird Californians he met while picking the ground-fall he made into slivovitz. Hanni and David were just as real as Josef, not storybook people living in a Slovakian version of Fiddler on the Roof. They were hardworking tavern-keepers who owned a cow, 2 goats and didn’t know how to read or write (according to the 1869 census). They lived in a small house (with a kitchen) where they raised a fine family of 9, children who could read and write and who became successful enough in Vienna and Budapest that they could buy their parents a fancy pink gravestone. Their oldest son, my great-great-grandfather Nathan, raised his family there as well and named his last two children (who were born after their grandparents’ deaths) Hanni and David. When they were all older, they moved away, making the same journey I made from Slovakia to Vienna but in a time when that distance was much greater. Nathan’s children, who kept pictures of their home and took their children to visit, remembered their birthplace with affection, passing that sense of place down to their children. When my grandfather and his cousins left Europe for California, for New York, for Israel, they took this sense of being from a place with them, and they somehow gave it to me.